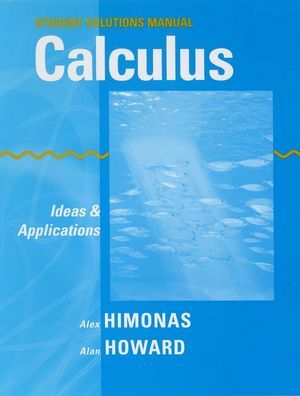 The Student Solutions Manual to accompany Calculus: Ideas and Applications helps students ensure their own success. With fully-worked solutions to every odd-numbered problem in the text, this book allows students to gauge their understanding, avoid incorrect habits, and study smarter instead of longer. Having immediate feedback on independent work helps students spot their own mistakes, and the ability to check their work against the correct process can reveal hidden issues with concepts, calculations, arithmetic, and more. Alex Himonas received his B.S. from Patras University in Greece, and his M.S. and Ph.D. from Purdue University. He is currently professor of mathematics at University of Notre Dame, where he has won the Kaneb Teaching Award and received numerous National Science foundation grants. His research interests include regularity of solutions to partial differential equations and the Cauchy problem for non-linear evolution equations. Alex grew up in rural Greece, surrounded by five siblings and ninety-nine sheep. His mathematical talent first surfaced when his father asked him to calculate the volume of their wine barrels in order to determine their holding capacity. His first encounter with Riemann sums came when he was invited to help the local surveyor measure the neighboring farms. As a youth, Alex was an avid beekeeper and also had a passion for astronomy. He spent many nights staring at the sky and studying the constellations. These days, Alex returns to Greece every few years. Outside of mathematics, he enjoys swimming, gardening, and family time with his wife and two children. Alan Howard received his B.A. from Rutgers University and his Ph.D. from Brown University. He is currently professor of mathematics and associate chair at University of Notre Dame, where he has won numerous teaching awards, including the Madden Award for excellence in teaching freshmen, the Shilts/Leonard Teaching Award, the Notre Dame President's Award, and the Kaneb Teaching Award. He has published research papers in complex manifolds and complex analysis. Alan was born and raised in Brooklyn, New York, where the only stars he ever noticed were those who played baseball for his beloved Brooklyn Dodgers. Alan's undergraduate major was English literature, and he has maintained a lifelong interest in reading and writing fiction. In the mid-1980s he was fortunate to have two mystery novels published under the pseudonym of N.J. McIver: Come Back, Alice Smythereene by St. Martin's Press and An Assassin Prepares by Doubleday. Alan is also an enthusiastic amateur musician, whose taste runs the gamut from Claudio Monteverde to Bill Monroe. His most persistent daydream these days is of sitting in as guest mandolinist with the Nashville Bluegrass Band. While waiting for that to happen, he enjoys music sessions with his wife, daughters, and granddaughters, singing such timeless classics as There Ain't No Flies on Me and The Teddy Bears' Picnic.